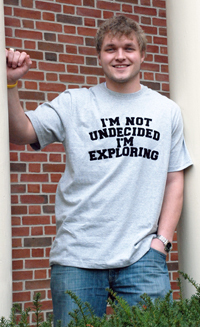 Nearly 20% of Lycoming's incoming class are undecided about their future major. And as freshmen, another 20% of Lyco students will change their mind and pursue newly found interests. In many ways, college is the best time for students to learn more about themselves and the world around them. And often, it is the best time to explore various course options and career paths. We're so certain of this advice that at Lycoming we do not require our students to declare a major until the second semester of their sophomore year. Students who enroll at Lycoming and are unsure about a major are assigned specially-trained faculty members who enjoy working with "exploring" students. In many ways these hand-picked advisors are more familiar with our 35 majors and 700 courses than their colleagues because they are committed to helping their advisees "find their path,"
"There are several of us on the faculty who actually prefer working with undecided students. It's rewarding to help students identify their personal interests, goals and expectations," notes Associate Professor Sue Beidler. "It's much more interesting than simply picking out classes to fit a major." In addition to meaningful academic advisement, we also arrange for students to complete a Strong Interest Inventory or a Myers Briggs Type Inventory. These fun (and enlightening) assessments help students match careers and jobs based on their personality type and their likes and dislikes. Both of these assessments are readily available (as well as ample career counseling) at the Career Development Center. "In my many years of working with students I've found that most bring ideas and preferences to the table. It's my job to bring out those qualities and then help students build meaningful and interesting academic schedules," says Sue Beidler. "In the end, choosing a major is a personal decision that will be made as a student gains experience and confidence."